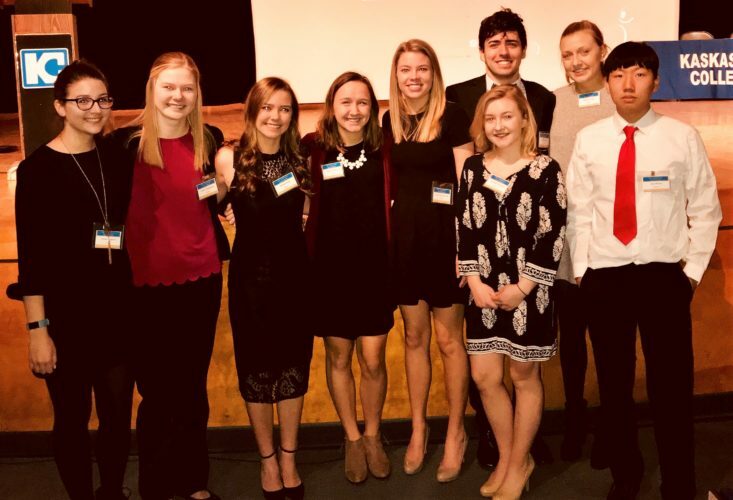 At the Future Business Leaders of America (FBLA) Southwestern Area Conference held at Kaskaskia College Saturday, January 20, Mater Dei earned the Largest Chapter Registration Award, with thirty-six members competing. In addition, the following students placed 1st, 2nd or 3rd in their category: Lacey Benhoff – 2nd in Advertising; Jacey Weiter – 2nd in Agribusiness; Grace Fuehne – 1st in Business Calculations; Alexis Patton – 1st in Business Communications; Gabby Kramer – 1st in Business Law; Jun Moon – 1st in Computer Applications; Ben Logullo – 1st in Computer Problem Solving; Amy Boeckman – 2nd in Economics; Madison Stone – 3rd in Health Care Administration; Quinn Cutler, Emma Rogers, and Adam Seger – 2nd in Hospitality Management; Matthew Fuehne – 2nd in Introduction to Business Communication; Hunter Lee – 2nd in Introduction to Business Procedures; Lainey Kramer – 2nd in Introduction to FBLA; Katie Toennies – 1st and Austin Voss – 3rd in Introduction to Financial Math; Ben Kasson – 1st and Bennet Krebs – 2nd in Introduction to Information Technology; Rachel Maue – 1st in Journalism; Kendall Bowman – 2nd and Abby Imming – 3rd in Organizational Leadership; Luke Goebel – 2nd in Personal Finance; Phusana Sawannachote – 1st in Securities & Investments; Malina Isaak – 1st in Spreadsheet Applications; Abby Arentsen – 1st and Lauren Kampwerth – 2nd in Word Processing. Finally, Emily Wiegmann was elected as the 2018-2019 vice president for the FBLA Southwestern Area. Please join us in congratulating our FBLA members who competed, as well as FBLA moderator Mrs. Heather Land! (from left) Emma Rodgers, Emily Wiegmann, Malina Isaak, Abby Arentsen, Lauren Kampwerth, Adam Seger (back), Kendall Bowman, Quinn Cutler (back), and Jun Moon are pictured at the FBLA Southwestern Area Conference, in which thirty-six Mater Dei students competed. Emily Wiegmann, pictured presenting her qualifications, was elected as the 2018-2019 vice president for the FBLA Southwestern Area.